Today we continue our learning journey to Chinese character 吉. It is composed of 士 and 口 obviously. What meaning did Chinese ancestors want to represent with 口 of 士? We have known that 王 originally meant the leader of a tribe, the big wizard, who can communicate with both heaven and earth. While 士 originally meant the assistant of 王, who were wizards as well. During a worship ceremony, 士 would surround 王 and speak blessings and good wishes. Thus Chinese ancestors created 吉 to mean good or blessing, utilizing the fact that 士 speaks (by mouth - 口) all good wishes and blessings. And from how 吉 was created, we can appreciate why 吉 is normally used in the scenario of wishing somebody something good to happen. One of Oracle Script of 吉 is , is believed to mean a pavilion, which could be used for sacrifice ceremonies. 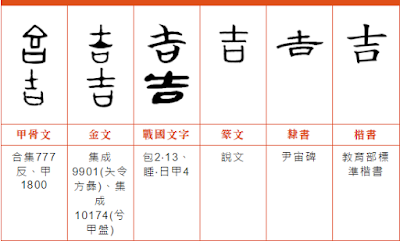 Its other Oracle Script is almost the same shape as our current 吉. 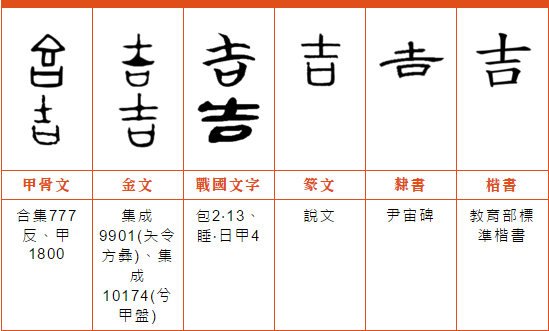 Our next lesson will continue with Chinese character 古, which is composed of 十 and 口, can you guess its meaning?